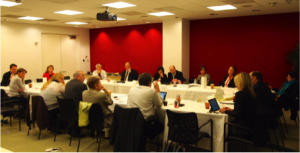 In December 2013, The Horinko Group held the Sustainable Chemicals & Materials Roundtable, convening government, private industry, academia, non-governmental organizations, and other interested parties to exchange information and discuss the current state of laws, policies, and procedures to integrate sustainable chemicals and materials into systems and products. Highlights from the discussion and key takeaways are detailed in the roundtable proceedings. The productive roundtable covered central topics including discussions on processes for developing, testing, and implementing sustainable chemical alternatives. Participants shared perspectives about chemical risk assessments, the use of scientific data in policy decisions, identifying priority chemicals for action, understanding the chemical and material content of products with complex supply chains, and cooperative solutions for joint testing and data sharing, among many others. To read the Proceedings, visit http://bit.ly/SCMRproceedings.